I have no problem with Maori flying their own flag on Waitangi Day. But the Maori sovereignty flag is the wrong choice. 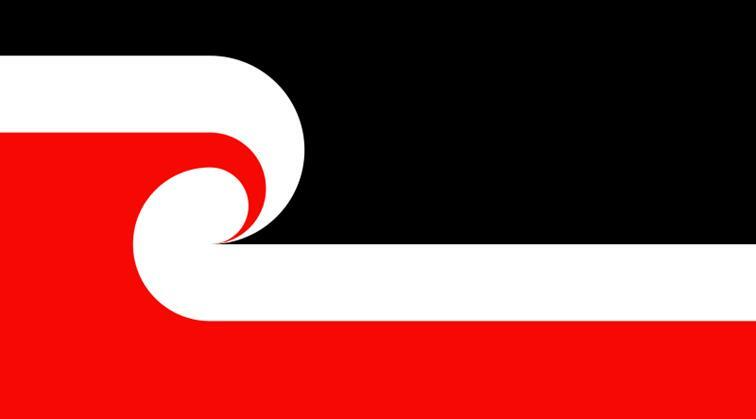 The above adaption of Jeffy James’s New Zealand flag (see below) would serve Maori better – on both political and aesthetic grounds. What message will it send on our day of national unity when Maori fly the banner of those wanting a separate Maori nation? But it’s hardly Maori’s fault. They were given only four options, and the other three were either British or English-based. They were hardly going to choose the existing blue ensign flag, or the equally colonial red ensign. Which left the United Tribes flag of 1835 – which features the English red cross of St George not once, but twice! Some choice for a proud people. They had no choice but to endorse the Tino Rangatiratanga flag, even though many would have preferred a less divisive emblem. It’s on the nzflag.com website and it’s by Jeffy James – one of the few really good flag designers among our artistic community. Now bear in mind that Jeffy designed this as a New Zealand flag, not a Maori flag. Were he asked to create a Maori flag, would he have simply removed the Southern Cross, as I have done above? I suspect so, but I don’t know. He says in his bio on nzflag.com that he likes the Tino Rangatiratanga flag. I worry that my cheeky redesign may offend him – in which case I apologise. But could there be a simpler, more beautiful symbol of Maoridom than Jeffy’s flowing white koru on red and black? As for the rest of us, don’t forget to vote in our poll of Ansell/Wang fern flags and view my latest ‘best of’ option. Note for fern lovers: the koru and silver fern are different representations of the same New Zealand native plant: the ponga. Previous postThe best of both flags? 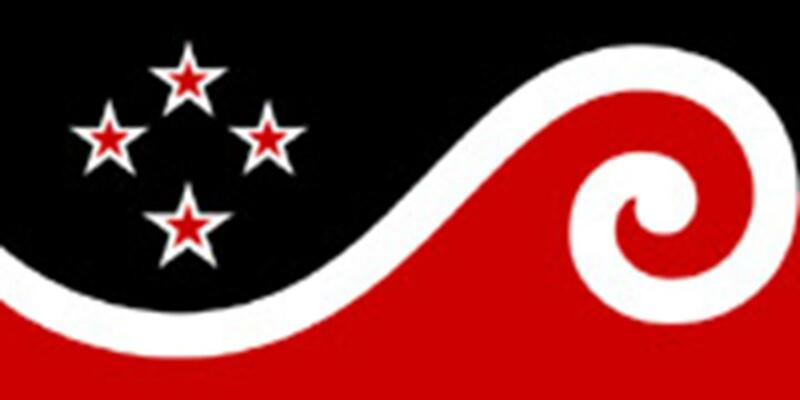 I’d be even willing to have that as a NZ flag (and I’m not a Maori), with or without the stars. 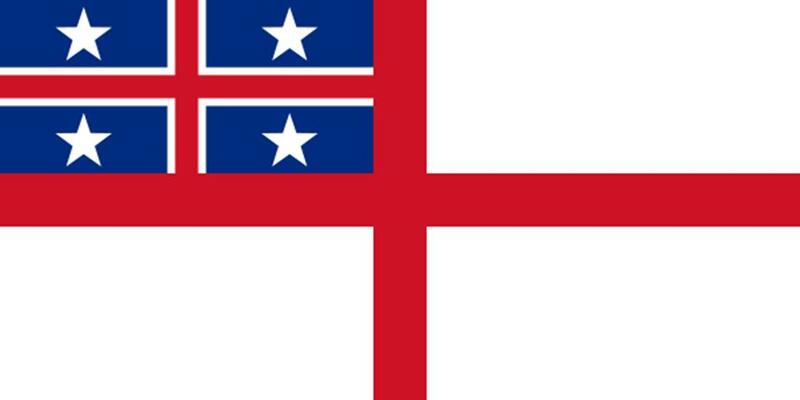 I would have no objection to that flying on the Harbour Bridge on Waitangi Day — apart from my overall desire that there be only ONE flag to represent all NZ. The big advantage is that it does not come with the political connotations of Maori nationalism. And who has to answer for the flag choices that were offered in the hui to choose a Maori flag? Talk about a foregone conclusion! I’d like to know that too, David. I think this flag would do a great job of representing the 15% of New Zealanders who are Maori (and all the white liberals who pretend to be). But it’s not going to fly with the public as a whole, nor would that be fair to the 85% of us who aren’t Maori. For a flag to speak for all races, it cannot show any racial bias. We both warm far more to the Jeffy James flag with the Southern Cross than to any of the silver fern versions. The black field could possibly be blue, which would help to retain the traditional red, white and blue symbolism without including the union jack. The silver fern is so strongly associated with sport and commerce that this alone disqualifies it as a political symbol. It would also be very bald by itself. What other symbols would be included? Has anyone checked if there are any international conventions about colours, the area to be covered by symbols etc. Thanks for your comments, Susan and Graham. Tell me, why does an association with sport and commerce disqualify the fern from flag duty? You make it sound as though there’s something unclean about those two pursuits. I’d flip it round and say that’s a strong argument for why it would make a good flag symbol – since it’s already the de facto national emblem in two major areas of New Zealand life. As to the ‘baldness’ of an unaccompanied fern, it would be no less bald than the Japanese sun, the Swiss cross or the Canadian maple leaf – among the strongest flags in the world. One thing I’ve learned since studying flags – and one reason, I think, why my black and silver design failed to catch on – is that they must be quickly recognisable when very small. Strong, simple designs have a better chance of doing that. So there’s a practical consideration. But more to the point, flag preferences are governed by emotion, not logic. A fern on black will inspire many, but also offend many, such as you. Similarly, any Maori design will evoke strong positive feelings among the 15-20% who are Maori, and the large number of liberal white Maoriphiles. But every survey I’ve seen suggests that that combined number is not high enough to prevail against the 70-80% non-Maori who feel just as strongly that a minority racial symbol has no place on the national flag. So the most rational choice would be a non-partisan (non-racial, non-imperial) symbol. And which rational symbol is also capable of fulfilling the all-important emotional criteria? Only one, I believe: the silver fern. But can a fern design capture the hearts of those, like you, who equate it with the odious rugby or the nasty corporations? That’s my next challenge. I’ll shortly be posting another design that attempts to do that. I actually like the wavey koru with the Southern cross stars design but agree with Susan and Graham that blue replacing the black would make it more New Zealand. The curve has a friendly feel, whereas the current Maori flag I think is quite aggressive and looks like a link about to break. Surely it should convey a universal nation. I’m doing some research on the history of the All Blacks jersey and I noticed in another article that you thought that the original NZ rugby team changed from blue with a gold fern to the Natives colours of black and white because it was difficult to see the contrast in old photographs. Where does this info come from? I’d like to quote it if possible. To be honest Michelle, I’m not sure whether I got that from somewhere else or advanced the theory myself. Possibly the latter. Sorry about that. I went to an open day at the NZRU recently, and they have on display replicas of all All Blacks jerseys, including the first. It’s a rather heavy wool, can you believe that? Hi there, your flag minus the stars is a fabulous image. Would you have any objection to me using it in my craft work? Gwenda, I’d be happy to give you permission, but of course my flag is just an adaption of Jeffy James’s, so ethically – and quite possibly legally – I don’t have the right. Maybe you should approach him (maybe via nzflag.com). koru and stars defiantly gets my vote and i’m not Maori either. I would prefer the black flag but this one is really nice. Black and red together looks angry and aggressive, probably why they are the Mongrel Mob colours. Look pass the colour of the flag and see it for what it is. Our flag. If you are really serious about change and a better future for our country then drop the attitude and celebrate the differences for they are what make us one people. So you have no problem with Maori persons flying a separatist flag at a celebration of the contract that ended all separate identity for maori? As for Tino Rangatiritanga allegedly being a degree of independance for maori, people should try reading what is written in the Tiriti o Waitangi and so avoid using this misquotation. The continued misuse of the the second law of ‘the treaty’ only reflects a total lack of examination and the desire to read only what is politically gratifying. As for the ‘Maori Flag’ and others offered as a potential national flag, the combination of red and black is on a spiritual level and indication of anger and agression. It is no coincidence that maori political movements and gang members crave this colour scheme. It is also indicative of the unresolved racial issues in NZ that 85% of the population are too often referred to as ‘non – maori’ Excuse me but we do have an identity of our own and should not ever be defined only by comparisom to this self selected group. Don’t know what planet you came from awa53 but you are wrong about the “Anger and aggression” YOU describe in the Rangatiratanga haki. Many Pakeha completely miss the point that Maori is our unique identity for the rest of the world. Cultural tourism is a growth industry in NZ. Maori culture helps distinguish us from the rest of the world. Sadly, if you know nothing of Maori culture, there is a tendency to express racist and put-down views such as some of the comments above. Maori are not ‘a minority’. They ARE the defining difference of this country for other peoples of the world. Pakeha need to understand Maori culture to move forward as a country. Maori are not the problem. Pakeha are. For example, who would want to be like your kind of Pakeha? – small-minded and redneck. You are not interesting. You belong on those dreadful talk-back shows for people who are afraid of tall poppies and intellectuals. You think we should all be as ignorant as you are. There is nothing threatening about Maori Nationalism except your own fear of it. You are the threat. Good on Maori for celebrating themselves. It is your fear of difference that is frightening – not Maori trying to survive in a world that tries to tell them who they should be. Go Maori colours! Go Maori flags! There is nothing in there for Pakeha to be afraid of. Deal with your fear and stop scape-goating Maori with your ignorance of their culture and their aspirations. Stop having a bogan mentality. I don’t want a flag representing white-trash thinking … oh you are not white trash? … neither are all Maori gang members ..duh! Good heavens Koopara. You claim pakeha are the problem in NZ, yet your comment spills forth your hatred of pakeha/white people from start to end. It’s that kind of racism this country can do without, where-ever it comes from. I know lots about Maori culture Koopara and there is very little to like about it. We all know where Maori problems start and it has nothing to do with the white man. You really are crazy if you think that gang members are loving parents of the year. I suggest you read Twisting the Treaty you might enlighten yourself. It’s time for Maori to stop playing the blame game and take responsibility for there own short comings, no other race in the world has ever been pampered to as much as Maori, yet they still fail in nearly every aspect of life, all the negative stats point glaringly at Maori but where are the so called leaders in your society? well they are just like you, hiding behind a pack of lies with their hands out never thinking that they and you should do something about it. Much easier to blame everyone else for your problems, so stop having a Maori mentality and get off your arse and do something. i find that there’s a resentment and “post colonial guilt” within new zealand,im proud that the crown won the maori wars,im proud that we have established this country as is,i think we need a blend of cultures not just 1 dominating the whole. as maori are a minority they need to remember that they wont have their way all the time,changing the flag changes alot,i dont agree with having a maori themed flag just as i dont agree with having a full union jack.